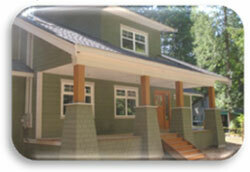 The Green Home Remodelling Series was originally created by the Seattle Department of Planning & Development's City Green Building Program and later was adapted by the Vancouver Sustainable Development Program. 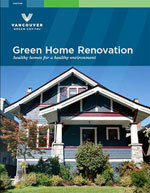 Please check the City of Vancouver's website for the complete series on Green Home Renovation. 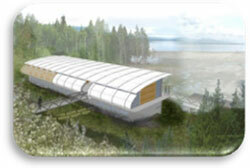 This field station is designed to achieve Leadership in Energy and Environmental Design (LEED®) Platinum standard, the highest level of this rating system. Currently still under construction, this project will take advantage of the waterfront site and use an ocean loop geoexchange system for heating and cooling. The field station will demonstrate how to minimize environmental impact in the coastal zone and become a significant teaching tool for the university and the public. 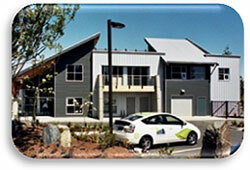 The E-Cube housing system has twice the energy efficiency of comparable houses built to standard code requirements. This house is constructed with superinsulated walls and roof using prefabricated Structural Insulated Panels (SIPS) and features a lively green roof, thermal solar collectors for domestic hot water pre-heating, photovoltaic solar collectors that generate electricity on-site and a rainwater harvesting system. Green building doesn't always mean expensive, as demonstrated by this unique adaptation of an old manufactured home. 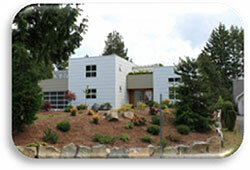 This house has been transformed from a single wide mobile home into a larger, highly energy-efficient three bedroom home through a unique double wall framing technique. 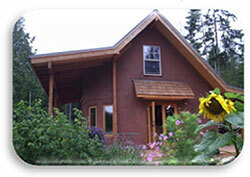 The house uses windblown trees milled locally, natural materials, low-VOC paints, and a greywater system. The owners phased the construction and renovation to work around their busy schedule. 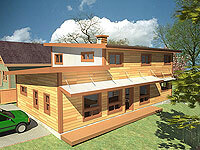 The result is an eco-friendly home at one third the cost of traditional construction. Guided by an integrated design process, the RDN Administration and Transit Building Expansion Project team worked together at the outset of the project to identify opportunities to optimize building performances. This process has led to the realization of many important features such as rooftop heat pumps that control heating and cooling, Heat Recovery Ventilators to supply outdoor air to the new offices, individual thermostat and operable window in each office to allow personal control of indoor environment, solar hot water system on the transit building for domestic water heating and a living roof that protects roof membrane, supports biodiversity, and manages stormwater runoff. This commercial office building achieves high level of energy efficiency through a combination of measures including a ground source geoexchnage loop system for space heating and cooling, incorporation of daylighting and natural ventilation, solar hot water system for domestic water heating and real-time performance monitoring system. The accessible green roof serves a practical function of managing stormwater runoff and also provides a pleasant social space for staff. Construction materials and finishes are carefully selected to improve indoor environment quality while minimizing environmental impacts. 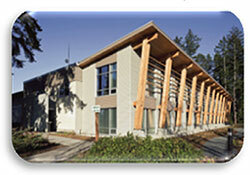 This project is aiming to achieve Leadership in Energy and Environmental Design (LEED®) Gold standard. This 12-by-12-feet micro home is a living example of efficient use of land and material resources. 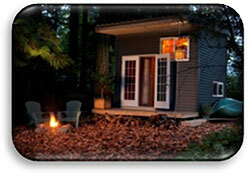 At the same time, it demonstrates that compact living can be comfortable, convenient and affordable. 12 Cubed Homes can be set up in conjunction with a primary household on an existing residential lot in an urban area or as an off-grid living unit at a rural location in the woods. 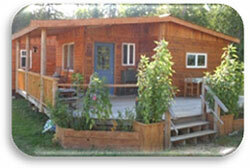 Can you heat a 2,500 square foot house for under $100 per year? This comfortable, heritage style BuiltGreenTM house includes high insulation levels and passive solar design features that dramatically reduce the cost of ownership. Built with Structural Insulated Panels (SIPs) and 24/7 Heat Recovery Ventilation, its annual heating costs are expected to be less than $100 per year. 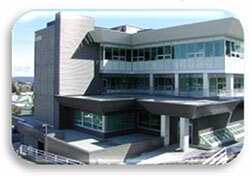 The Faculty of Management Centre is Vancouver Island University's most environmentally sound and technologically advanced building of the institution and the first building to be Leadership in Energy and Environmental Design (LEED®) certified. The electrical consumption of this facility is more than 30% efficient than a conventional building by conserving more than 356,000 kilowatt-hours of electricity through the use of energy efficient lighting fixtures and occupancy sensors. The natural gas consumption is almost 40% more efficient than a conventional building which is saving the equivalent of 340,000 kilowatt-hours through a Direct Digital Controls system (DDC) allowing the heating and cooling systems to be controlled and monitored through a computerized energy management system to optimize the buildings energy performance. Through the use of water efficient washroom and shower fixtures this building saves 1,077,000 liters of water per year compared to a similar building of conventional design and construction. 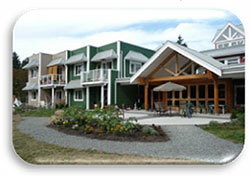 Pacific Gardens Cohousing is Nanaimo's first and only cohousing project. This is a resident-planned development in a beautiful location with an emphasis on community, cooperation and quality of life. The shared facilities and physical design of this project support community connection and foster sustainable behaviour. Many site planning and building design decisions are made to minimize environmental impact to the site, encourage on-site food production, and make living in a compact community safe and enjoyable. Jack Anderson, a passionate green home designer of 3 decades offers up his own residence for viewing. The home continues to evolve as time and finances permit the continued integration of new green design principles and systems. The home was developed on a strong emphasis for passive solar gain, natural lighting, energy and water conservation and food production options. 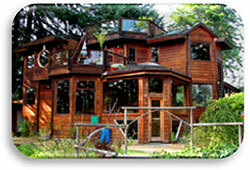 The home is surrounded in emerging permaculture gardens and protection of the adjacent natural habitat of the Nanaimo River Riparian areas. The approx. 2000 square foot, country style, family home includes such features as; a two story passive solar sunspace, an active solar hot water system, rainwater collection and garden irrigation system, a grey-water recycling system, a full roof top garden and a number of other subtle features he will be happy to passionately explain. His home based design studio fronts the property and provides a venue for the many innovative green home and community scale projects that he and his Greenplan team continue to develop for communities on the island. 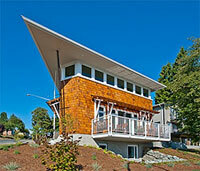 This house is a design-built energy efficient home that utilizes many natural and locally sourced materials. The project incorporates passive solar design strategies and features a solar hot water system, grey water re-use, suspended earthen floors, living roofs, earthen plasters and two unique super insulating exterior wall systems. This house is a post and beam construction with straw bale and light straw clay infill finished with lime plaster. The orientation and passive solar design allow this house to take full advantage of the southern solar exposure to naturally condition the interior space. The use of local natural materials and finishes not only reduces the environmental impacts associated with manufacture and transportation of construction materials but also creates a healthy indoor environment. The passive solar design optimizes the performance of this house, minimizing heat loss in winter and heat gain in summer. The foundation and walls are constructed of Insulated Concrete Form (ICF) blocks, achieving insulation values up to R-24. With additional assistance of a Structural Insulated Panel (SIP) roof system, the operating energy cost of this house is expected to be reduced by 45 to 60%. In-floor radiant heating and natural ventilation increases overall comfort and improves indoor air quality. The in-home monitoring system allows real time observation and control of comfort level and energy consumption room by room. 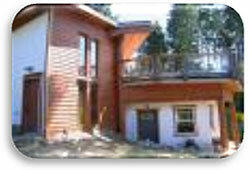 This house aims to achieve BuiltGreenTM Platinum certification. For more information, please contact B. Gallant Homes www.bgallanthomes.com or email info@bgallanthomes.com. This 1,700 sf house, developed on a triangular 3,000 sf corner lot in Nanaimo, conserves energy by heating, cooling, lighting, and ventilating itself naturally year round without relying on mechanical systems. The building envelope is designed to provide exceptional insulation values, acoustical properties and ait tightness. The house incorporates a passive solar system that preheats outdoor air before it is delivered through a heat recovery ventilation system. The ventilation system circulates fresh air and exhausts stale air in and out of every room and is driven by a passive wind turbine. For more information, please contact designer Nathan Middleton through his email nemiddle@telus.net.